Sister Ave Maria McCusker, I.H.M. 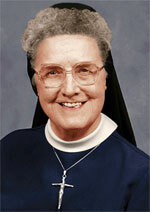 Sister Ave Maria McCusker, I.H.M., died Jan. 4 in Camilla Hall, Immaculata, in the 68th year of her religious life. She was 87 years old. Born in Philadelphia, Sister Ave Maria entered the Congregation of the Sisters, Servants of the Immaculate Heart of Mary in 1947 from St. Monica Parish, Philadelphia, and professed her vows in 1949. She taught science in many high schools in the Archdiocese of Philadelphia. She was a member of the Chemistry Department at Immaculata University for over 22 years. She was assigned to Camilla Hall in 2006. The funeral Mass was celebrated Jan. 7 at Camilla Hall Msgr. Joseph Logrip was the celebrant and homilist, and the concelebrant was Father William E. Dean. Sister Ave Maria is survived by members of her religious community and by her loving nieces and nephews. She was predeceased by her parents James Leo and Elizabeth Hatty McCusker, her brother James McCusker and her sisters Elizabeth (Butch) Carrigan, Anna (John) Fritz, Margaret (Jack) O’Leary, Rita McCusker, Cecilia (Edward) Staats, Mary (Albert) Derr, Theresa (Larry) Kazaronowitz.